Renaissance Girls, is the new single from Oh Land’s highly-anticipated new album Wish Bone, due out Friday 1 November featuring her distinctive brand of left-field pop, the album features collaborations with Sitek, as well as additional contributions from Sia, WNDRBRD and Dan Carey, among others. The new track is fun, infectious, danceable electro pop with great underlying back beat and piano overlay and the singer delicate vocals. Rocking a pair of pink dungarees and strutting around a abandoned warehouse, similar to the video by Robyn when she released Dancing On My Own, however the difference is the beautiful singer takes inspiration from her past in ballet, the video features light-hearted choreography juxtaposed by the harshness of an abandoned warehouse setting ending in a full on dance party. Oh and by the way Oh Land, love the ponytail grab, we are soooo doing that in the office this week..! 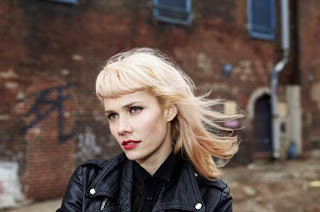 For the recording of the album, Oh Land collaborated with Dave Sitek, holing up in his studio in Los Angeles and allowing the process to reflect the spontaneity of everyday life. “The collaboration was very intuitive,” explains Oh Land. “”We didn’t plan what we wanted to do, we just pressed record and played a million different instruments. We were both eager for the songs to sound likes the lives we were living at the time, so we kept some of the ‘mistakes’ on purpose, maintaining the integrity of what was delivered in the moment.” Fittingly, the album was recorded using analog equipment and features brass horns, harp, and even a choir all recorded live. The result is reported to be Oh Land’s most raw and immediate album yet. Renaissance Girls is available on iTunes now..!